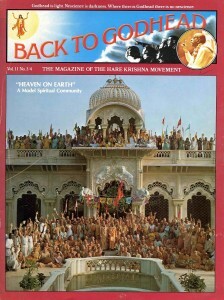 ISKCON Members chant Hare Krishna in Mayapur. With roots in pre-colonial America, Philadelphia’s New Year’s Day Mummers’ Parade of elaborately costumed string bands and colorful floats has been a city-sponsored classic since 1901. This year’s parade was certainly unique for Krishna and Arjuna were there, the Supreme Personality of Godhead Himself along with His most heroic devotee, riding on their chariot surrounded by chanting, dancing Hare Krishna devotees. Televised live during the parade and highlighted on the evening news, the prizewinning Krishna chariot and marchers were the result of a joint effort by ISKCON and the Charles Klein New Year’s Association, a famous Mummers’ Parade marching club of over sixty years’ standing. The Klein Club then designed and built a dazzling sixteen-foot yellow and red chariot, complete with canopy and “drawn” by three life-size white horses. The chariot was designed and decorated according to the famous Krishna and Arjuna painting on the cover of Bhagavad-gita As It Is. In addition, the Republican party donated a large white elephant mounted on wheels, which was later draped with a crimson Hare Krishna banner. “Everything in Krishna consciousness is always increasing,” goes a favorite ISKCON saying, and the New Orleans temple farm in Carriere, Mississippi, proves the point. Temple leaders are negotiating the purchase of an additional two hundred fifty acres of land, which will expand the Deep South farm community to well over four hundred acres. Lots of hard work in the spirit of devotion to Krishna has produced bountiful results from the fertile Gulf Coast soil. For example, last fall the farm’s three acres of sugarcane provided one hundred gallons of syrup. Right now, thirteen hundred strawberry plants are sitting in a one-acre garden, and, in a poor year for pecans, devotees still harvested over two hundred gallons of the nutritious nuts from twenty trees. In addition, forty acres of winter rye grass is helping to nurture a herd of forty-one cows, calves, and bulls. “Here at the farm we produce all the milk, curd, butter, ghee, and cream our temple in New Orleans needs—and then some!” said temple and farm president Nityananda dasa Adhikari. Having just constructed a milking house adjacent to the farm’s twin seventy-foot silos, the New Orleans devotees are presently getting thirty-five gallons of milk a day from sixteen cows. But the heavy construction begins in the spring, when a hilltop temple overlooking all the surrounding countryside is due to be built. The worship room will be seventy by fifty feet, with a split-level floor and a balcony, and above this will be a large feasting hall. Nityananda dasa invites other ISKCON devotees as well as interested visitors to come to Carriere and take advantage of Krishna consciousness in a rural setting.